Chlorophytum are evergreen ornamental houseplants for both indoor and outdoor plantation. The most prominent and commonly grown specie is Chlorophytum Comosum or Spider Plant which is grown as ornamental houseplants. Chlorophytum produces grass-like green leaves that are usually stripped with white, cream of yellow pigment. These ornamental plants are suitable as ground cover, for hanging baskets and for indoor container gardening. While flowers appear on long stalks on mature Spider Plant. These stalks also produce tufts of small leaves that can be easily rooted to make new plants. Chlorophytum is a good plant for beginners because it is easy to grow and does not require any special care. They prefer regular watering, a general fertilizer in growing season and bright filtered sunlight. 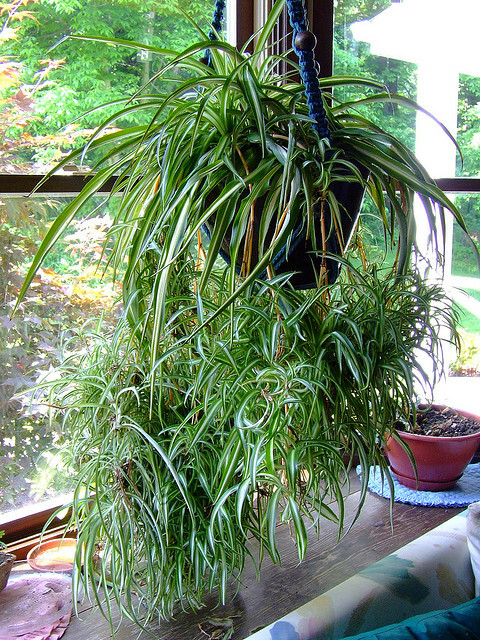 Most Chlorophytum plants can be propagated easily and rapidly from divisions. Chlorophytum Capenses is an evergreen foliage plant that produces dense clumps of long leaves (up to 6 cm). White, usually insignificant, flowers are borne on long spikes. Other popular species grown as ornamental houseplants include Chlorophytum Comosum ‘vittatum’ (Spider Plant), Chlorophytum ‘Picturatum’ , and Chlorophytum ‘Variegatum’.